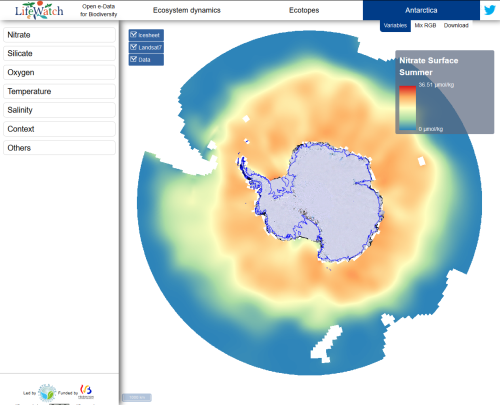 In addition to the land surface dynamics (weekly unusual snow cover and vegetation greenness; annual summary of fire events) and the ecotope database (integrated quantitative database of the abiotic and environmental variables based on large scale polygons), new data and tools are now available for Antarctica and the Southern Ocean. This was made possible thanks to a partnership with the AntaBIS project (another Belgian contribution to Lifewatch ERIC). Furthermore, a second year of data is now available for the ecotopes (2006 and 2015). Last but not least, the user interface has been improved and the underlying datasets have been consolidated.